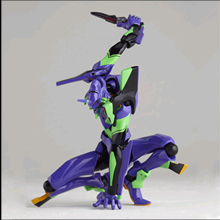 These are brand-new remolds of all of the Evangelion mecha as seen in the 2009 feature film, "Evangelion: 2.0- You Can (Not) Advance". 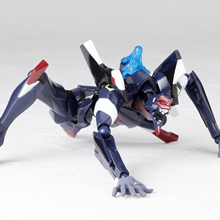 The new line is called "Evangelion Evolution", or "EVA EVO" for short. 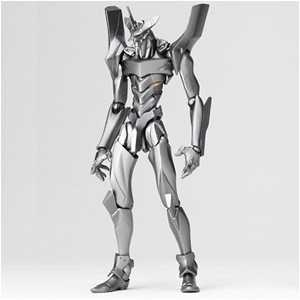 For Units-00 through -05, each features most of the accessories from previous releases, but in these sets each includes a specialized section of the Angel they fight in the movie! 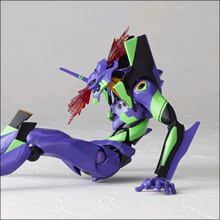 (For Unit-03, because it is the 9th Angel, it instead has a piece representing Unit-01 being pinned against the valley wall.) 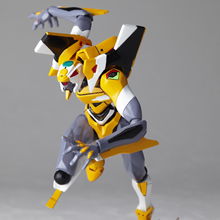 The biggest notable change appears to be a new hip joint system for Units -00 through -03, which allows the knees and inner thighs to touch each other for the first time. 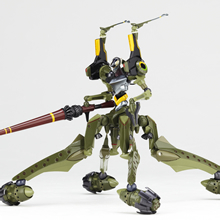 Additionally, Unit-05 now has updated coloring and accessories to reflect screen-accuracy compared to the orignal 2009 Revoltech release. 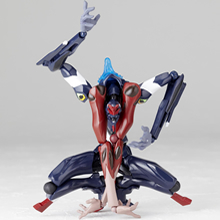 Multiple hands (and, in the case of Unit-02, utility wings) and power umbilical cables are also provided with each, except for Unit-05 and the Mark.06. 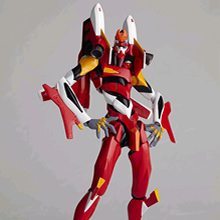 The 4th Angel's core has a built-in red LED that can be turned on-and-off. 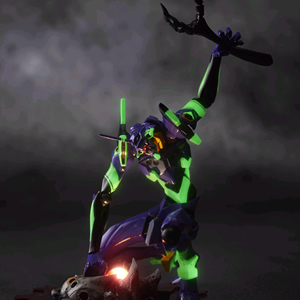 All of the neon-green paint on Unit-01 can glow in the dark after you've shined a light on it for a little bit. 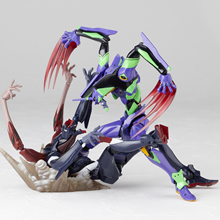 Two heads are provided- one where Unit-01 is roaring, and the other showing blood spraying out the front and back of the head. 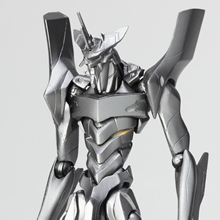 A unique transparent base is provided that Unit-02 can be attached to. 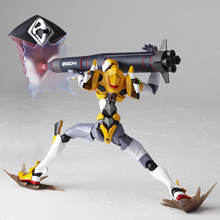 When the peg on the side is turned, the attached EVA will spin through the air as if dodging the spears coming from the 7th Angel! 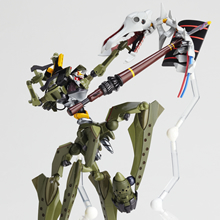 (Each of the four spears also attach to the base on their own individual Revoltech joints.) 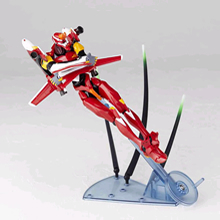 A clear standard two-jointed Revoltech display stand is also provided. 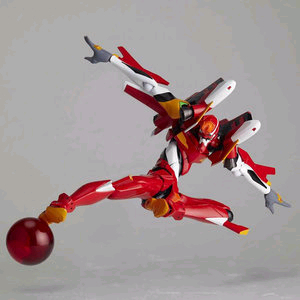 The separated core of the 7th Angel can be pegged onto the foot of Unit-02, appearing just like it does in the movie! 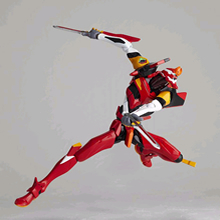 Also, a different core for the 8th Angel is provided, and you can recreate the moment where Unit-02 drives its Progressive Knife into the core with its knee! 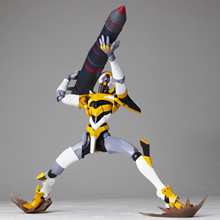 A Large N2 Missile is provided, which can peg into a specialized set of hands. Both bandaged and non-bandaged arms and right thigh are provided. 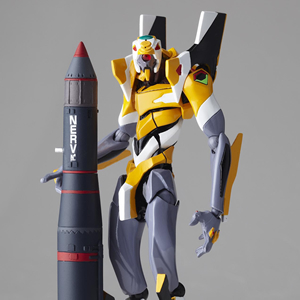 An in-scale head-and-chest bust of the 10th Angel is provided which can peg onto the nose of the Large N2 Missile, either with or without the extra clear-blue AT Field piece! 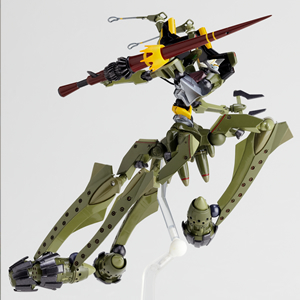 Ground-effect pieces can also be pegged into the feet of Unit-00. The utility wings can be replaced with the Angel's extra pair of arms! 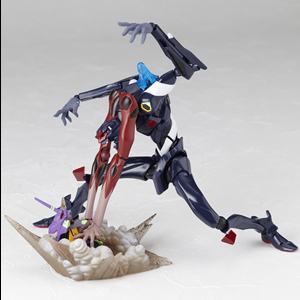 A pair of 'blood-spattering' hands are provided for Unit-01 if you want to display this figure with the other separately-sold set! 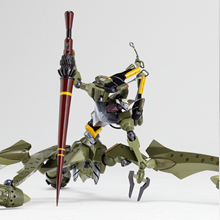 A new version of Unit-05's spear arm has been made, with a detachable hit-effect piece near the hilt. 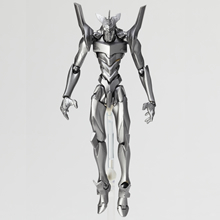 A clear three-segment Revoltech stand is provided which can help suspend either the head of the 3rd Angel, or Unit-05 itself, for dramatic poses! 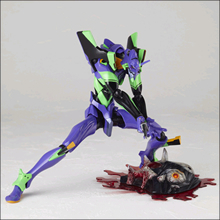 Although I'm no fan of the Eva mechs on either side or the conflict, these are actually pretty cool diorama "sets". 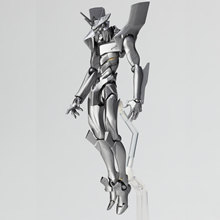 I didn't like how fragile Revoltech are (which is why I largely avoided getting any EVAs, but got a few other robos), but these are starting to change my mind, and I feel like I need to collect 'em all now!